I haven't posted on my blog in such a long time. I have a two and a half year old toddler who takes up 99% of my time. I love him to pieces. I'm tired all the time. But he's worth it. So much has happened since I last blogged. Including meeting David Duchovny when he toured the country last month. An incredible experience. He was lovely and it was a 24 year dream come true getting the opportunity to meet him and have my photo taken. However everything isn't all dreams come true. In November last year we lost our fur baby Stewie, very suddenly. He was fine one day, sick the next and gone the next. There are days that go by where I think I can't cope with losing him. There are days when I'm not sure I'm okay. Yesterday mum lost one of her furry babies after an ongoing battle with illness. He went peacefully in his sleep, just like Stewie. He's now away from the struggles he had every day and we should be grateful that he's resting in peace. However it is bringing up a lot of unresolved feelings I have for Stewie. I miss him every day. I cry for him nearly every day. The worst part about losing Hudson yesterday, is seeing poor Diesel all alone and missing his fur brother. He is completely lost. He looks SO incredibly sad. I know in time, like us, he will be okay - but it's breaking my heart watching him be so sad. If you have fur babies, please hug them extra tight. You never know when they are going to be taken from you. I certainly wasn't ready for Stewie to go. It is going to be quite some time before we are ready to fill our lives with furry paws... I think we are going to have to wait until Z is old enough to have his own dog. 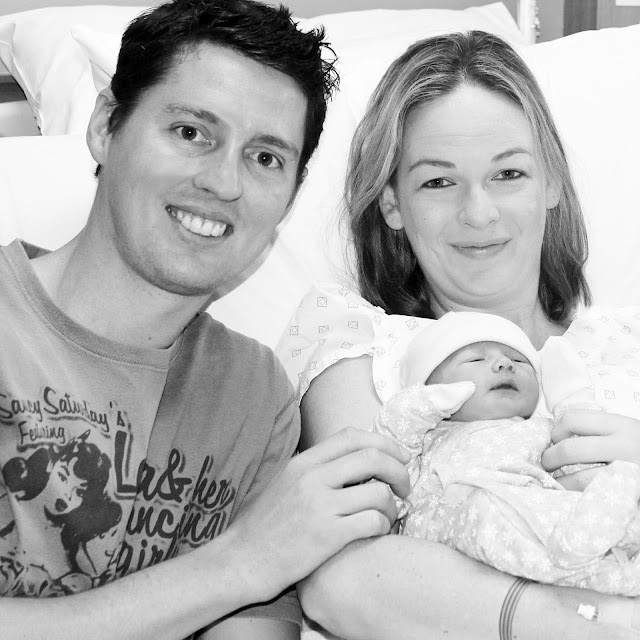 My husband and I welcomed our gorgeous son Zander into the world on 11/11/15. Our Remembrance Day baby. Family complete. Mum, Dad and Baby. Puppy loves his furless brother. The road to certification for me has not been an easy one - nor a happy one in the beginning and middle stages. It has been filled with roadblocks, injuries, deaths in the family, illness, huge self-doubt and then finally an indomitable will that no - nothing was going to stop me until I reached certification. I joined my local gym in February 2013 to try and drop a dress size to fit into a beautiful vintage wedding gown, that I had bought for my wedding in January 2014. I joined with plenty of time to lose that amount and then tone up so I could be at my best for my wedding day. I was walking away on the treadmill, bored out of my brain... I saw a bunch of people going into the Group Exercise Studio. I had no idea what class it was, but I jumped off the treadmill and went in and got a spot. That class, was BodyJam. I didn't know that not only going to help me lose that dress size in four weeks - but was going to become something that was insanely addictive... and as my instructor Niki said that it would "ruin you for all other classes...". It did. I went from two classes a week, to doing as many as I could... all around Brisbane. At one point I was travelling between Carindale, Nundah, Alexandra Hills and Cleveland. I loved it so much that I then thought... I want to share this program with as many people as I can. 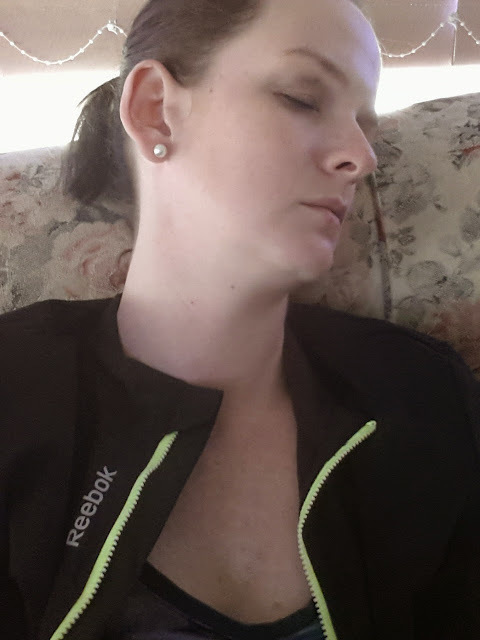 The decision to become a BodyJam instructor was one that wasn't taken lightly on my part. It was one that I really sat down, read the material, and worked out if it was something that I thought I could achieve. I didn't know if I wanted to actually ever teach the program. I knew I loved the program - so much to the point that I got a lot of my friends to come along and try out the classes (some of them got hooked too) - but I am not a trained dancer... in fact I have been known to trip over my own feet on occasion. Who am I kidding... quite regularly! Haha. I suffer from nervous anxiety when I have to get up and talk in front of people. So - was I going to be co-ordinated enough to not only present perfect technique, but be able to deliver clear instruction too? Was I going to be fit enough? Was I going to be able to get past people watching my every move, and almost certainly judging my delivery as well. One of my last classes as a participant! Sitting down with two Les Mills Asia Pacific (LMAP) Trainers who I just happen to have as my permanent instructors, I started to see and hear about this idea of a "journey" towards becoming an instructor. Every instructor has a different journey and it's a process and I was told that if I was to take it on, to trust the process and that if I wanted it bad enough (aka put in hours upon hours of work) I would achieve it. So. While in Canada I got the news that the module was going ahead. Awesome. Got back from Canada and had two weeks to get my fitness back to where it needed to be to get through the module. The Saturday before module, I injured myself pretty badly. Not knowing at the time I had developed Shin Splints. Niki, Johnny and New Jam Trainees! I did everything in my power to make it through that initial module weekend. 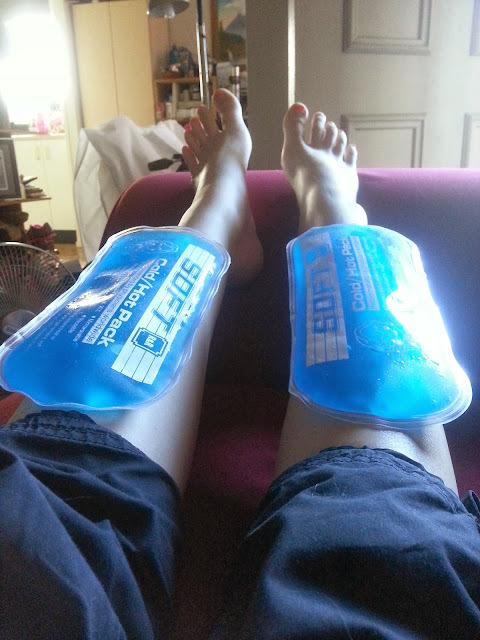 As terrible as it sounded I lived on pain killers, slathering my legs in all kinds of gels and creams (Fisiocrem is the actual best thing in the world) and regularly icing and resting. About an hour before final presentation I didn't think I was going to be able to get through - but some how, I did. I was passed as a trainee. Best. News. Ever. The next four months saw me doing everything I could to aid my legs recovery. Three gorgeous instructors achieved certification, two of them taking the stage at VP Healthworks for their cert videos. It was so inspiring to watch them go through the process, and all I could do was be patient and await my turn. At times, I wasn't patient. In fact, I went through some of the biggest doubts of my life. I never thought my legs were going to heal. Then towards the end of May, beginning of June... they did. Was told by my mentor Niki to get my coaching and cues together. I was ready to take the stage... and then my grandmother passed away. All it took was that trauma, and I lost everything that I had in my head. Now not only did I need to get it back in my head so I could teach successfully - I wanted to do this even more for my Nan-Nan. She was so proud that I was doing this. Niki and I discussed the time frame that I had left to certify on the release that I had put so much work into - and it was decided that I'd take the stage in the third week of July. I did everything I could to make sure that I was ready to teach the front half of the class. And I did! It was the most nerve wracking thing I have ever done - but I survived. Over the next few weeks I would only improve and lead the class successfully through the release. It was so nice to receive such positive feedback from not only my fellow trainees, but the participants in the classes as well. Healthworks Victoria Point Studio One became my home away from home. When I wasn't teaching or shadowing in classes, I was in front of the mirror... or listening to my music and practicing my coaching. Let me tell you - the level of exhaustion that I felt during those 6-7 weeks of "training" was something that I have never experienced before. A massive thank you to my husband who had to deal with me during this time - and really was my biggest fan. As my deadline approached, I was surprised how quickly the progression happened. I taught around 7 times in the class environment, and twice in a "Faux Jam" environment - a real class, but not on the scheduled timetable. Thank you so so so much to my friends who came to support me in both of those classes. You are all rockstars. My "Faux Jam" class with my gorgeous friends who came to support! One of the two videos was better than the other. So we submitted it. Was told by LMAP that it could take 4-6 weeks to be marked and to receive a result. So it's official. I'm now a Certified Les Mills BodyJam instructor. Just awaiting the arrival of my certification feedback and my certificate. Then I'll register and will be ready to teach! It's been a pretty crazy and at times overwhelming journey... but it has been so rewarding. It's brought me closer to everyone who has supported me along the way - and I have made some lifelong friends within the "Tribe". Massive thank yous go out to Kacie and Matt, for supporting my training from day one - and letting me use the studios whenever I needed them for practice. The biggest thank you goes out to my mentor Niki, who dedicated so much time and energy into my training - spending time away from her family to do so. I'll forever be in your debt. You believed that I was capable, and in turn I started to believe that I was too. Now I know that I am! It's been awhile since I've done an update to my blog - mainly because I've been so busy concentrating on getting my fitness back, learning choreography, attending various appointments about my shin splints, and now frantically practicing my technique. All in the name of BodyJam. So, in the last few months since I've posted... I've attended my first super workshop (Filex) which was in Melbourne. The only word I can use to describe that experience was awe-inspiring. Not only did we get to participate in the upcoming releases for Les Mills, we got the opportunity to meet the program directors and ask them questions. I asked Gandalf "G" Archer for some advice that he had for new instructors and he had some really good advice - especially about finding "yourself" and your own essence within your program. It was also really cool getting to spend some time in Melbourne not just with my gym/Les Mills crowd - but with my AXF Geeks. We had "dinner" together on the Friday night at Max Brenner of all places. Mmmm Waffles. Special thanks to the gorgeous Col who let me crash at her place on the Friday night. Since then, I've been attending physiotherapy weekly - well, now it's down to fortnightly. I've been to the podiatrist and have orthotics for my Reebok High-tops. Everything I can do try and get these shins under control so I can get up and start teaching. Shortly after Filex I got up and shadowed BodyJam 68 with my mentor. My fitness level wasn't there, and my shins weren't ready, so I went back to training to get the fitness level back. It's now been 13 weeks since my original injury, and I have to say that only today am I starting to feel normal again - my muscles have been recovering quicker, and my shins aren't really painful after classes/drilling/mirror work. In the last two weeks I've had two pretty intense mirror work sessions (Thanks Niki, love your work) and I've recovered fairly well from them. I think I'm finally getting somewhere. I've been shadowing at Cleveland and Victoria Point while another trainee takes the mic and works towards certification on the same release that I'm training on. Feedback has been good, and we can only improve. I'm pretty daunted at the prospect of taking the mic again in a few weeks time, but at least I've got a few weeks on stage prior to that - and plenty of time to build my fitness so that I can really get to full "breakout". I still have doubts every day. 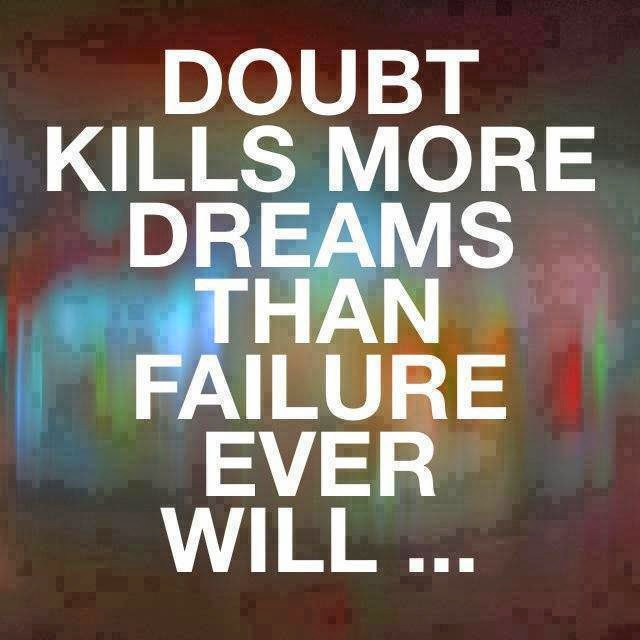 But those doubts are becoming less and less. It's slowly becoming "yes, I will get there." The best thing I can do right now is chill out here at home and heal... but all I want to do right now is put my reeboks on, and go dance in BodyJam class. I want to apply everything I learned (and more) and get up and present my tracks to a class. I'm ready to continue on this journey I started a few weeks ago... alas, I'm sitting here with my trusty ice-packs and am lost in my thoughts. This is where doubts start to sneak in. I'm not a trained dancer... my technique has to come a long way... and I can't practice while I'm injured so I feel like completely lame. I need to be less hard on myself andnot push it, but doubt makes you do silly things. Head made the decision to take the weekend off... heart is really upset right now. Not looking for sympathy or encouragement... just wanted to express what's going on.